There was a time last night when I thought that the predictions of my doomsday neighbour were about to come true … the storm turned out to be even worse than expected with winds well in excess of 100Kph, multiple power blackouts and torrential rain. Over 300 mm has fallen in the last 48 hours and it’s raining again now. Today the town is in a bit of a mess. 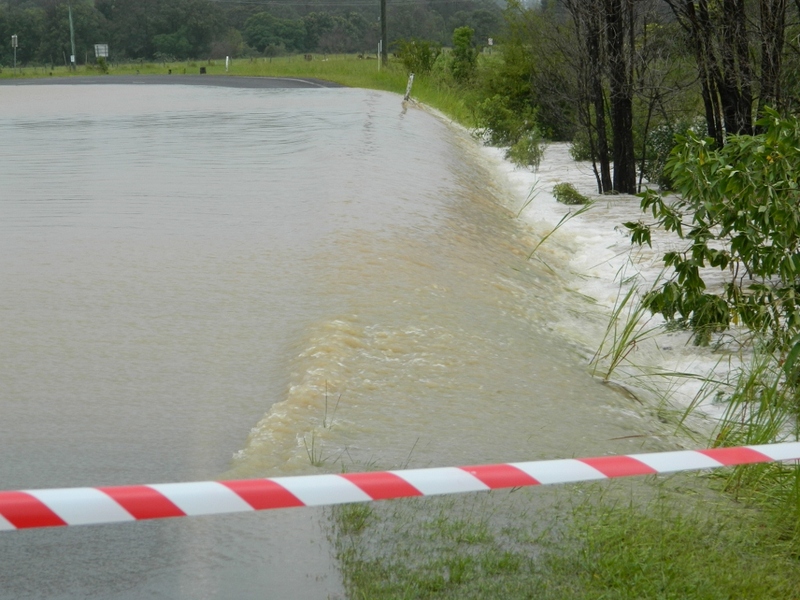 Bellingen is cut off in every direction … even Crown Street at the end of my road has turned into a small weir. The river level rose to 9 metres overnight – which was last experienced in the historic 1974 floods. The Old Butter Factory, where I work one day a week, is flooded and inaccessible. The four lovely Tulipwood trees in my driveway were blown horizontal and may not survive. The town is littered with fallen trees, branches and leaves. Every now and then, a helicopter buzzes overhead, and chainsaws can be heard in the distance as some residents start the clean up. Previous Going under again ….